The T.E.A.C.H. Early Childhood® and Child Care WAGE$® Initiatives are outcome driven. The outcomes address the enduring challenges that plague the early childhood field - high turnover, low compensation and insufficient teacher education. Data collection is critical to the success and expansion of both initiatives. Through systematic data collection it is easy to see the important contributions they are making to the early childhood field. You can read about the collective accomplishments of T.E.A.C.H. 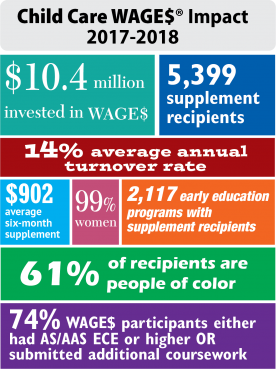 and WAGE$ Initiatives in our annual national program report.